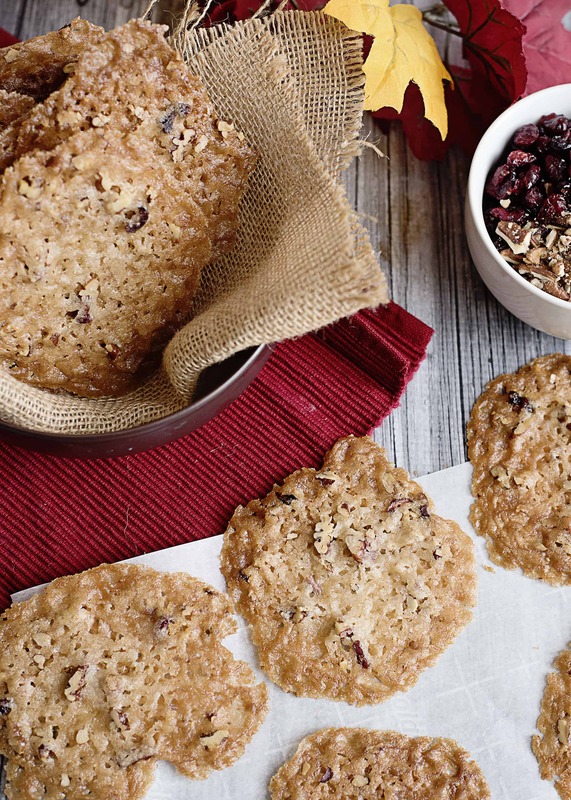 Have you tried any new cookie recipes this year? We have a lot of classic cookie recipes that we make each year but I always enjoy adding one or two new ones into the mix. 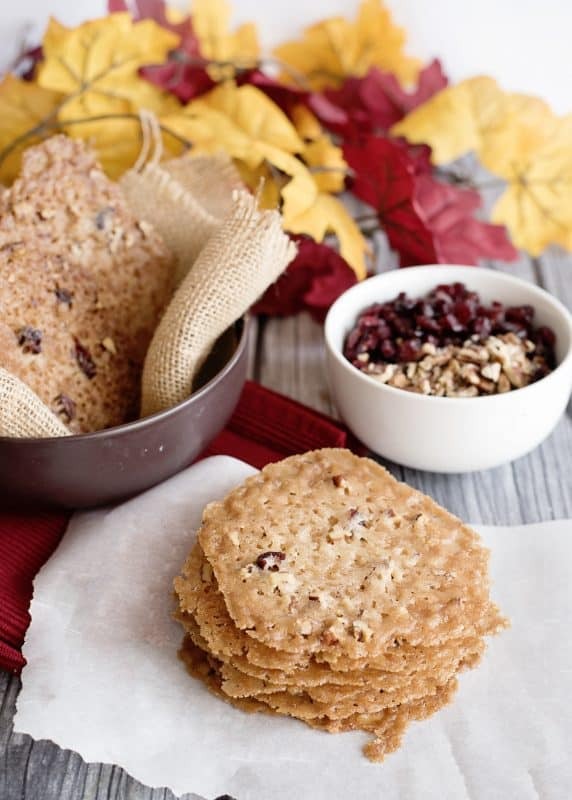 Today I’m sharing a gorgeous and fun Cranberry Pecan Lace Cookie recipe that is set apart from the rest. 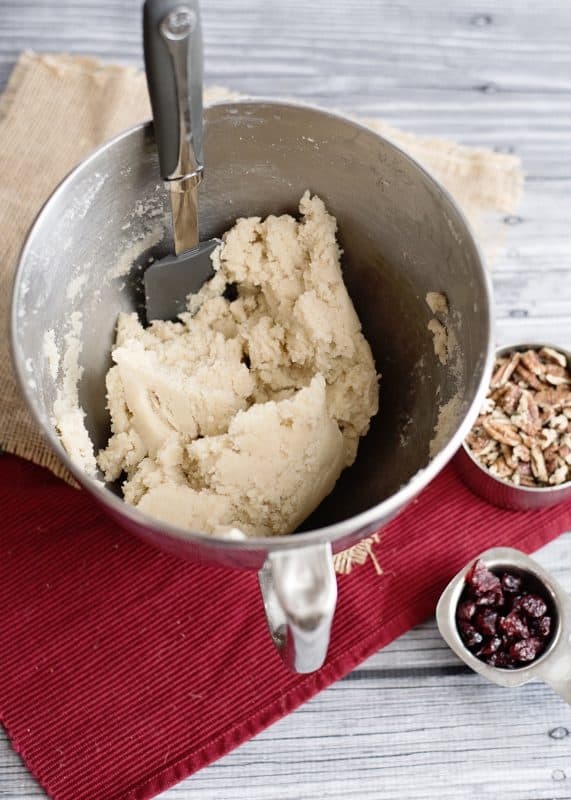 I first saw this recipe from Stephanie Jameson of Fairview, TN on Just A Pinch a few months back and knew I had to add it to our cookie rotation this year. 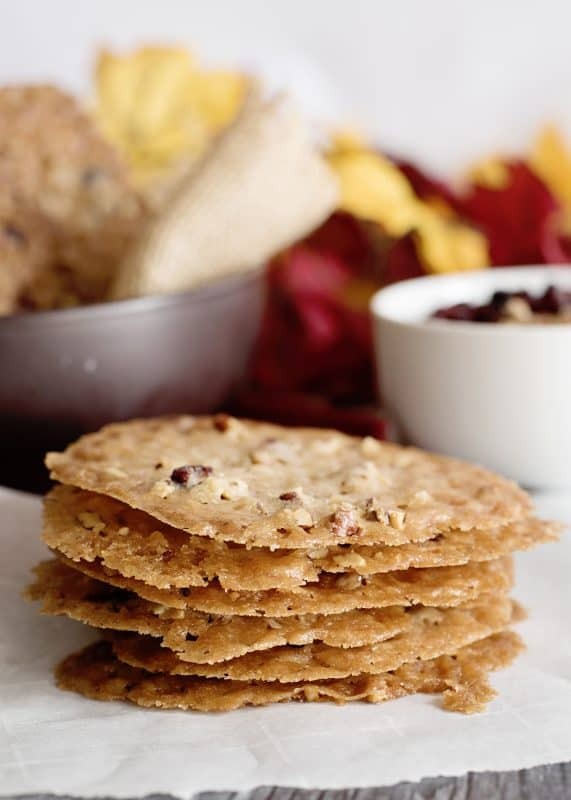 Not only are these cookies beautifully different from the rest of the cookie tray, they are also delicate and delicious – and the addition of pecans and dried cranberries just takes them over the top for me! Hop on in the kitchen with me and let’s bake some up today! 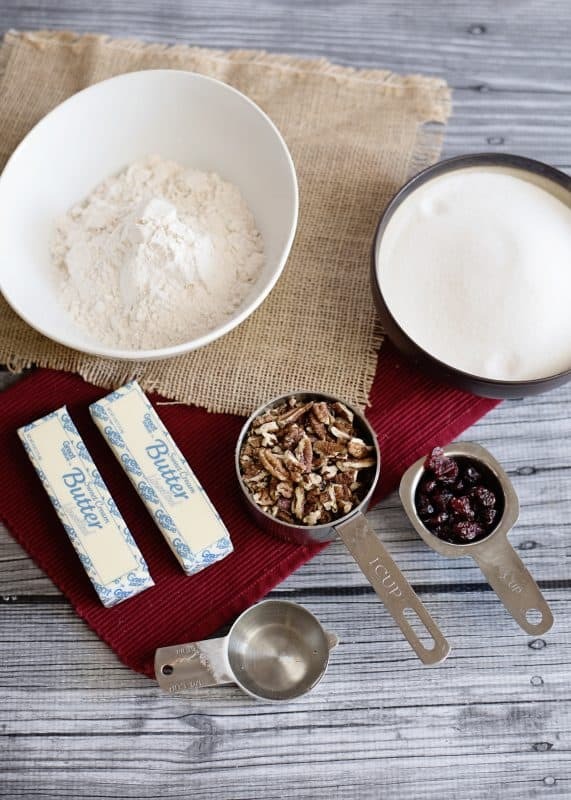 You’ll need: Confectioner’s Sugar, Butter, All Purpose Flour, Corn Syrup, Pecans or walnuts, and dried cranberries. In large mixing bowl, place butter and confectioner’s sugar. Beat with electric mixer until light and fluffy. Add in corn syrup and beat again until incorporated. Add in flour and beat until full combined, scraping down sides if needed. 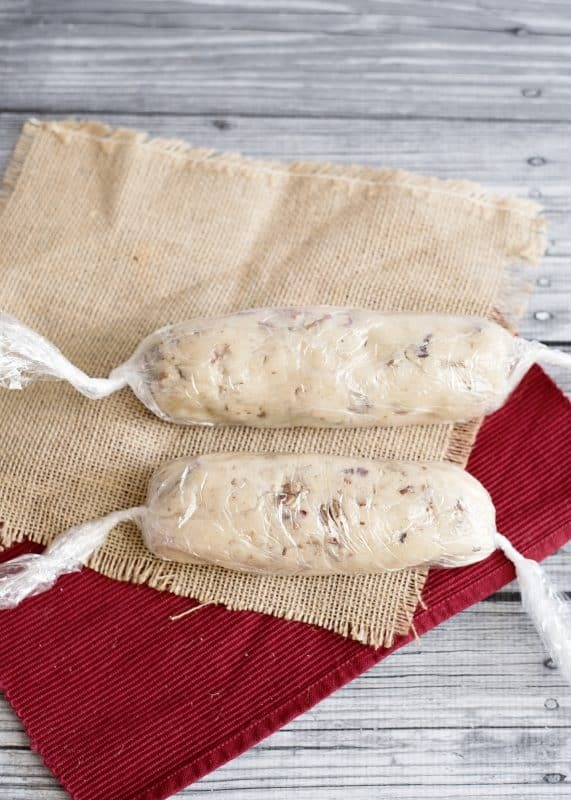 Form dough into two logs about six inches in length and wrap each one in plastic wrap. Place in the fridge for at least two hours or until firm. Remove one log at a time and unwrap before cutting into 1/4 inch slices. Place each cookie about three inches apart on an uncreased foil or parchment lined baking sheet. Bake at 350 for about 11-12 minutes, or until cookies are browned and lacy. Remove from oven and allow to cool completely before removing from foil. In large mixing bowl, place butter and confectioner's sugar. Beat with electric mixer until light and fluffy. Add in corn syrup and beat again until incorporated. Add in flour and beat until full combined, scraping down sides if needed. Remove one log at a time and unwrap before cutting into 1/4 inch slices. Place each cookie about three inches apart on an uncreased foil or parchment lined baking sheet. Bake at 350 for about 11-12 minutes, or until cookies are browned and lacy. Remove from oven and allow to cool completely before removing from foil. Enjoy! Our greatest blessings are often right under our noses, just waiting to be appreciated. Maple syrup is a lot thinner and has more water content than corn syrup so I am thinking it may not be a good substitute unless…you cook it down to a syrup the same consistency as corn syrup. That way it is thicker and the water has been mostly cooked out. Just be careful not to burn it. Kimberly, this is a well thought out answer and I appreciate you taking the time to leave it. I agree with everything you’ve said. I think honey would be a better substitute in terms of consistency, Darrellyn, but just know that I haven’t personally tried it. I feel pretty confident, though. We also have this delicious product called yellow label syrup where I am that would work really well. This cookie is definitely going in our rotation. These look delicious…can’t wait to try them! I see the recipe calls for confectioners sugar but is it just me or does it look like regular sugar in the first photo of ingredients?? Thanks for sharing your recipes! Hi Christy! Thanks for recipe! 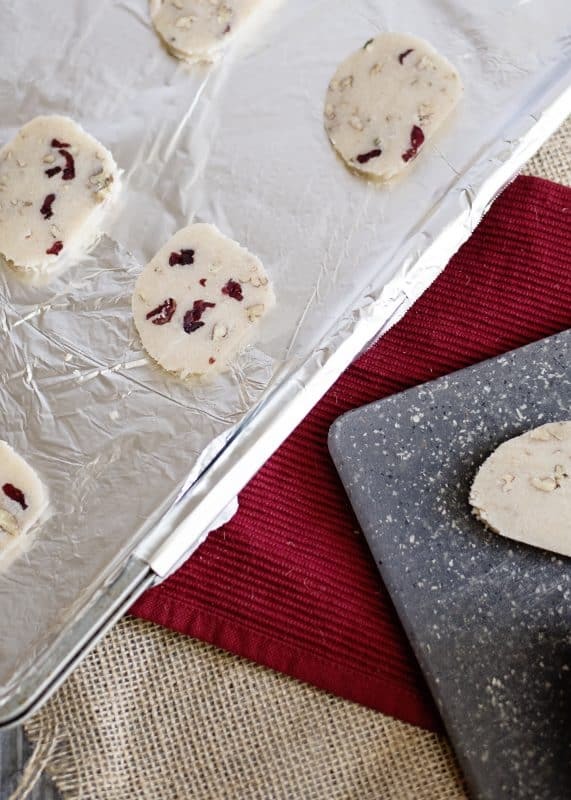 I love anything cranberry 🙂 I was wondering if you’ve ever thrown in a little orange zest, and if so, how much would you use? Orange Cranberry is my favorite combo ever! I took down recipe will certainly try it something different. 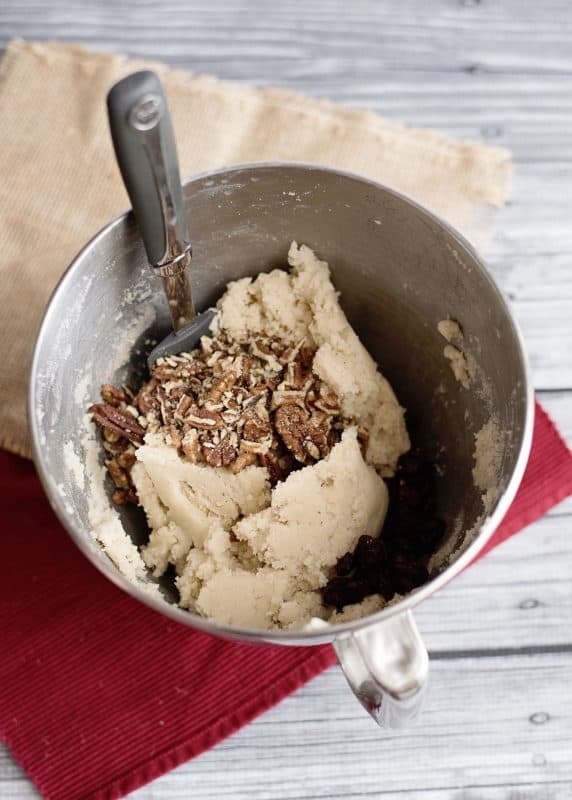 Can you just use pecans? I have dried dark cherries on hand do you think that will work or should I try the candied fruit that I have for fruit cake making? I would try the cherries Victoria. I think the candied fruit would change the texture too much. 🙂 They are Daniel, you really need to try them! My cookies all ran together in a very thin layer and tasted more like pralines than cookies. Any idea what happened? I do live at 4000 feet elevation, would that make a difference? 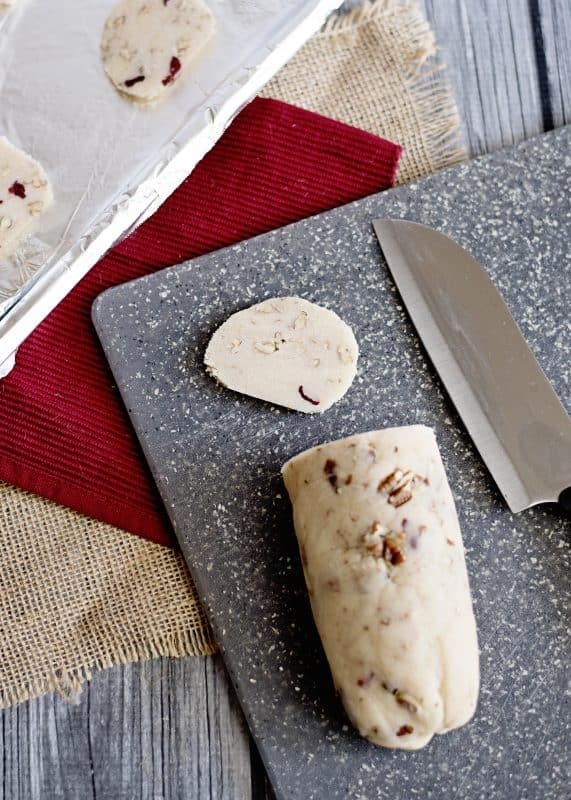 Can this dough be made ahead of time, a week, and frozen?